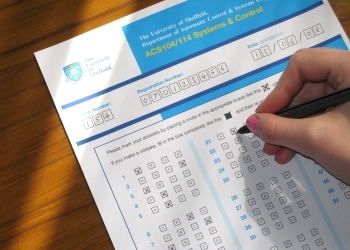 By using the scanning bureau service provided by Kendata Peripherals, the Department of Automatic Control & Systems Engineering at the University of Sheffield has been able to dramatically reduce the amount of time taken to mark the exam for one of its most heavily subscribed courses. In previous years, students on the Systems & Control course were required to provide written answers in the exam, and staff would then be faced with the task of double-marking nearly 200 scripts. This process needed to be completed by a certain date so that the results could be presented to the University's examination board before being passed on to the students. "Marking the exam would take two to three weeks of pretty intensive work," said Dr Rob Harrison, Reader in Computational Data Modelling, "and with student numbers continuing to rise, it was becoming increasingly difficult to maintain consistency and accuracy in the marking. It was just not sustainable." To address this situation, the Department decided to move to a multiple-choice exam format, and a great deal of work went into devising appropriate and challenging questions. As it was anticipated that the new format would lend itself to some sort of automatic marking, Dr Harrison duly set about finding a suitable machine to handle this task. Initial research threw up three potential suppliers of technology such as forms processing systems and optical mark readers, and inquiries were subsequently e-mailed to each one. While two of the suppliers responded with quotes for their products, Kendata contacted Dr Harrison to gain a better understanding of his requirement and very quickly advised him against buying a machine at all. With only 200 forms to process once a year, purchasing the hardware would have been very difficult to justify. Instead, Kendata suggested that the Department consider using the company's scanning bureau service, and immediately Dr Harrison could see the benefits: this would save a substantial amount of money, there would be no need to learn how to use a new machine and to get to grips with it again each year, and above all the whole exam-marking process could be completed within a couple of days. The decision was made. The first step for Kendata was to design a standard answer sheet for students to use in the Systems & Control exam, and, with the company's many years of experience in designing forms for data capture systems, this was accomplished very quickly. Once the exam was over, the completed papers were sent to Kendata, where they were scanned and processed using automated systems and the company's in-house developed ScanAnPro forms-processing software. As well as providing a complete audit trail by printing a unique identification number on each sheet as it is scanned, the software randomly selects a number of forms from each batch for QA validation in accordance with the sampling requirements of ISO2859/BS6001, thereby confirming the integrity of the data. "The whole process went very smoothly indeed," commented Dr Harrison. "Within two days of sending the completed exam papers to Kendata, we had received a summary report and, more importantly, an Excel spreadsheet of the results, which we could then import into our local exam marks system." The Kendata scanning bureau service saved an enormous amount of staff time, and the Department is now looking at the possibility of extending its use to other courses with large numbers of students.